Five Little Monkeys Jumping on the Bed is a classic counting nursery rhyme / song that has been turned into a series of books. It's a perfect beginner book for young children and new signers because of it's repetitive nature. There are many activities you can do along with this book. This is a great story to use finger puppets or toy props with for imaginary play and practicing counting and sequencing. Reading the book is also a great time to talk about the bedtime routine. The monkeys take a bath, put on their pajamas, brush their teeth, and say goodnight, all before the jumping starts. If you are telling the story at bedtime and have done all of these things already to get ready for bed, you can ask your little one if they did the activity after signing what the monkeys did. For example, “Five little monkeys brushed their teeth… did you brush your teeth?” There is even a Five Little Monkeys Jumping on the Bed board game you can play with your children (although maybe not at bedtime!) that also has you act out each bedtime routine while playing. There is a short, 3-minute video on Amazon Prime that tells the story of the Five Little Monkeys Jumping on the Bed. The author went on to develop a series featuring these same characters, so children can revisit their favorite monkey siblings as they read in bed, bake a birthday cake, sit in a tree, play hide-and-seek, go shopping, wash a car or with nothing to do. 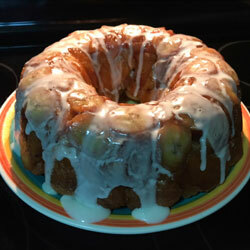 For a great recipe that goes with the theme of this book, see my article Cooking Up Language with Signs: Banana Monkey Bread. I hope through the Five Little Monkeys Jumping On The Bed pre-built word list you will feel confident to share this story with your children. It’s a Christmas classic, but it was written in an Old English format, so the words are difficult to sign. 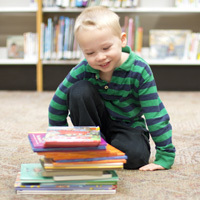 Many struggle with whether to follow the classic words, exactly the way they are written on the page (for fear of not honoring a classic), or to sign it more conceptually correct in signs and terms that are easily understood by young children – it is a struggle anyone who reads the book has to tackle. I have done this book a few different ways. One approach I took with my upper elementary students that really worked out well was to take the lines from the book, verse by verse. I typed them up on a page or wrote them on the board, one sentence or phrase a day, and really dove into the meaning of what the author was saying. Then together, as a class, we decided how we wanted to sign the verse so that it was clearly understood. This allowed the students to really own the way the story was told. We then went over to the school where the young deaf children were, and did some storytelling with them and told the story through a little signing and acting. The children loved it! Typically, the rule for words that don’t have signs, is you fingerspell them. For example, in The Night Before Christmas when it talks about “Mama in her 'kerchief,” you would fingerspell K-E-R-C-H-I-E-F. If you want to explain what ‘kerchief is, you could fingerspell K-E-R-C-H-I-E-F and then sign SCARF afterwards (or, however you think is best to describe a kerchief). 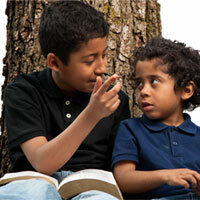 By fingerspelling, you aren’t changing the words or details of the original story. 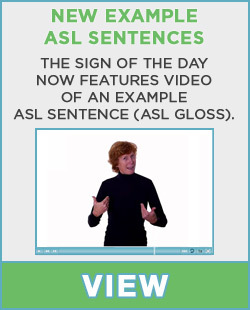 After paring the fingerspelling of the word with a sign the first time, you can then use the sign throughout the rest of the story when referencing that word. Fingerspelling all the words that don’t have signs, like kerchief, would mean fingerspelling much of this book. It would also be a more accurate and direct translation of the book. However, before you decide how this classic should be handled and how things will be signed, you first need to think about who your audience is (both who is telling the story and who is observing). My audience for this book has typically been young children, let’s say 1 year to 10 years old. My opinion is that these young children are more interested in the story and good storytelling than in receiving an accurate, direct translation. Therefore, I tend to focus on selecting signs that help deliver the main message, rather than staying razer-focused on providing a direct translation. It’s also important to remember that sometimes it is parents or grandparents with limited sign vocabulary or experience that want to sign this book. 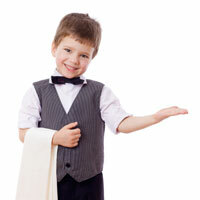 The goal is to share this Christmas classic with our young deaf children. Focus on the message of the story and have fun with it! People may have different opinions of how they would want to sign the story, and that is fine. You can change things up based on your audience and your signing skills. 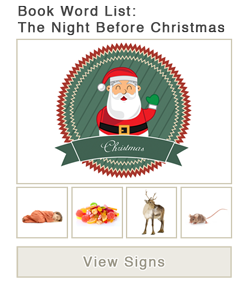 Below is the Night Before Christmas in English word order using ASL signs. As I drew my head and was turning around, Down the chimney St. Nicholas came with a bound. His eye, how they twinkled! His dimples, how merry! And the beard on his chin was white as the snow. And laying his finger aside of his nose, And gave a nod, up the chimney he rose. BUT I HEAR SANTA SAY, MERRY-CHRISTMAS TO ALL AND TO ALL A GOOD NIGHT! I hope that through this The Night Before Christmas pre-built word list you will feel confident to share this classic with your children. Today I’m cooking up "Homemade" Double Chocolate, Candy Cane Cookies. These cookies look like a million bucks and taste even better, yet they are so easy to make (you start with a cookie mix from a bag). 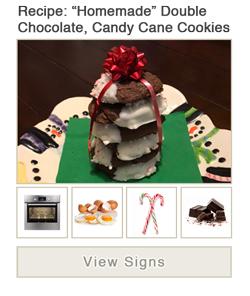 They are fun to create with your kiddos as a gift for parents, teachers etc..
Betty Crocker makes a great tasting Double Chocolate Chunk cookie mix that comes in a bag and are very easy to make with just limited ingredients to add. You can find the cookie mix at many grocery stores. After making the cookies, I dip them in white chocolate / crème and crushed candy canes to transform them into an irresistible holiday treat that everyone loves. 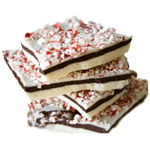 Enjoy making these quick and easy holiday treats. Use the pre-built word list created to go along with the recipe to help you as you make this tasty recipe. Once done baking, remove the cookies from the oven and let them cool. Remove the cookies from the pan and set aside. Unwrap candy canes and place in a Ziplock plastic bag (sometimes it helps to use 2 Ziplock plastic bags together so if you get a hole in the bag, the pieces won’t fall out). Crush the candy canes with a small hammer, or roll with a rolling pin. Melt white chocolate / crème in the microwave as directed on the package and dip the cooled cookies ½ way in. Lay the cookies on waxed paper or tin foil. Before the chocolate cools completely, sprinkle with the candy cane pieces. 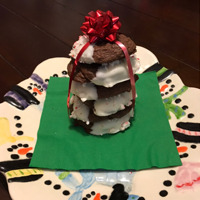 Once all cooled, stack the cookies and tie them up with ribbon and a bow for a great looking gift! This is another holiday classic! Frosty the Snowman is a song that was developed into a book and animated movie, that is shown on TV every year during the holiday season. 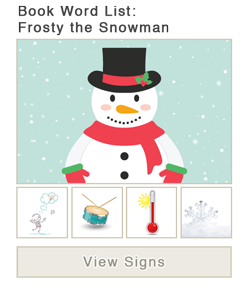 The first time you introduce the jolly snowman, you must fingerspell his name, but after that, you can set him up in space OR create an assigned sign name for him. You can discuss with the children what would be a good assigned sign name. I personally have used a right F handshape on the left side of the chest over the heart. Don't hesistate to take some creative licensing with the "thumpetty, thump, thumps," and don't let it scare you that there isn't necessarily a sign for it, just have fun with it and think of Big Frosty running through the snow covered hills with the children. I hope that through this Frosty the Snowman pre-built word list you will feel confident to share this classic with your children and experience the magic of Frosty together! Today I’m cooking up "Frosty The Snowman" Oreo Truffles. These are some of the easiest no-bake treats I make, and every time I take them anywhere, people go nuts over them! 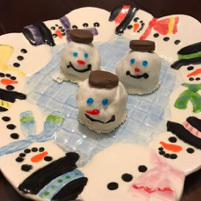 You can make them for any occasion, but you’ll see here how I’ve turned them into snowmen for the perfect holiday treat. This recipe is great to go along with the Frosty the Snowman book or song. I’ve also created an article and word list for the Frosty the Snowman book. The recipe is simple. Have the kiddo’s crush up the Oreos, either in bowl or in a doubled up Ziplock plastic bag, until they are nice and crushed. Mix together in a bowl with the cream cheese. Roll into balls and place in the freezer for an hour. Once nice and frozen, melt your white chocolate (I believe they are calling it crème or cream now). This can be tricky because it goes from good to overcooked really fast, so watch it as you are melting it and only start with 60 seconds, then add like 10-15 seconds at a time. Once melted, just dunk the balls in and set them on a pan with waxed paper or tin foil that you will be placing back in the refrigerator. 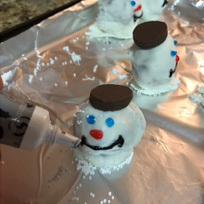 Don’t worry if your balls don’t come out perfectly round or the faces look a little silly as the kids are decorating… maybe Frosty is melting... it is pretty warm in the kitchen! Melted or not, round or lopsided - they still taste delicious with a cup of hot cocoa! 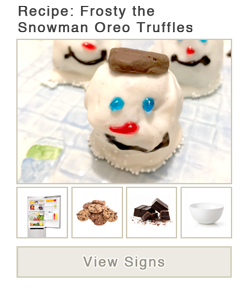 Enjoy making treats that look like Frosty the Snowman. Use the pre-built word list created to go along with the recipe to help you as you make this tasty recipe. Crush up the Oreo cookies either in a bowl or in a doubled up Ziplock plastic bag until they are nice and crushed. 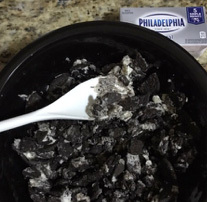 Mix the crushed Oreo cookies together in a bowl with the cream cheese. Roll mixture into balls and place in the freezer for an hour or until frozen / hard. Once balls are frozen, melt your white chocolate (also called crème or cream) in the microwave. Dunk the frozen Oreo balls in the melted white chocolate and set them on a pan with waxed paper or tin foil. 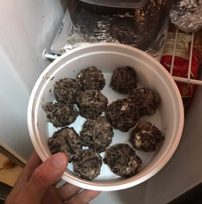 Place the tray of white chocolate covered Oreo balls back in the refrigerator. Once the outer white chocolate shell has hardened, use gel frosting to decorate them to look like Frosty with his eyes, button (or carrot) nose, and his big smile! Top him off with a mini Oreo cookies and/or Rolo candy top hat.